Site: Sweet bay laurel requires full sun but needs protection from easterly winds with a soil or compost containing lime. Water regularly but not too much during summer months. During the wintertime, it needs very little water. 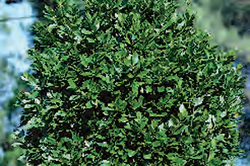 Growing: A sweet bay laurel will grow to about 15 - 20 feet tall in milder climates. Its growth is slow only about 1 foot each year. This is a great plant to grow in a large container for the first 5 years of its life. If you live in an area where the winters do not reach below 25 degrees you can plant them outdoors. If you live in an area with harsh winters, leave it in the pot and bring it indoors during the winter. Harvesting: To harvest leaves, just pull individual leaves from the sides of the stem. Cutting off a branch tip will make the plant branch out into a fuller shrub. Culinary Uses: In cooking, remember that fresh sweet bay is stronger than the dried bay leaves, so use very sparingly. The scent is not present until the leaf is heated, when the oils are released. One fresh leaf in stews, and spaghetti sauces is usually plenty.